The Putangirua Pinnacles near Cape Palliser are some of the most amazing rock formations you will ever see. Put on your sturdy walking shoes and do a day trip, or bring the family camping here. Doing this walk early morning is best for the affect of the early sunshine coming through the rock formations and generally avoiding the heat of the day on this walk. This spot has star quality too - Peter Jackson (a local guy, you might have heard of him) filmed here for The Lord of the Rings: The Return of the King. The pinnacles are an hour's drive south of Martinborough or a little longer from Featherston. When you see your first Pinnacles, you'll be wowed! But keep going the rock formations become absolutely incredible. From the carpark you can walk up through a defined bush walk to the viewing platform down onto the Pinnacles. Then make your way down into the valley. Make sure you walk up the riverbed to the very best formations. Alternatively the route from the carpark straight up the valley to the Pinnacles changes with the river flow. Hop, skip and jump the water flow and then turn left up the gravelly riverbed. Keep going to the top; you won't be disappointed. Allow at least two hours return and take food and water with you. Looking for a place to stay around Palliser Bay? Talk to the Martinborough i-SITE Visitor Centre or book a bed right now. The Land Girl Pirinoa Coffee House - a perfect place to stop for great coffee and simple, delicious food. Cape Palliser Lighthouse; Lonely Planet ranks it in the top 10 flashiest lighthouses in the world. 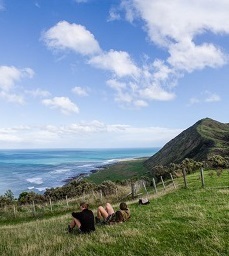 Surfing, diving and fishing spots that dot the Cape Palliser coastline. This largely untouched part of the Wairarapa is pretty special.